What do you get when you combine great food, wine, and excellent musical entertainment surrounded by inspiring local art? You get the Belmont Heights Artists’ Association (BHA2) Group Exhibition, which opened on October 6th to a packed reception at the Viento y Agua Coffee House and Gallery on 4th Street. 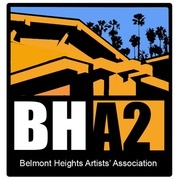 Hosted by the BHCA, the evening was planned and organized by our very own Sydney Simon and artist/member Ellen Butler. The show featured an eclectic selection of artwork representing the work of 21 artists who all reside in Belmont Heights. The range of artists showing this year included familiar faces like Donald Tiscareno and Sarah C. Arnold, along with newcomers like 18-year-old Lily Fast. The large-scale art of photojournalist Raquel Landworth-Kleinhenz is also on display, depicting Guatemalan life through the lens of her camera as she accompanied an orthopedic surgical team on a mission to Guatemala. Now in its 4th year, the Exhibition has grown considerably in size and popularity due in part to the support of community grants from the Arts Council of Long Beach and from the Port of Long Beach. Local caterer, Peta-Gaye’s Kitchen (a Belmont Shore Chocolate Festival blue ribbon winner) served artistic appetizers. The crowd-pleasing group, Second Wind (celebrating their eighth year together), provided the tunes. Thank you to all who volunteered to make this event so successful, and a big thank you to those who support our local artists, and to Viento y Agua (4007 E. 4th St) for welcoming us back every year.